Edited and content added by: A little remembered October event with Masonic ties was the Congressional Authority given to then President, Brother Thomas Jefferson, to take possession of the Territory of Louisiana (October 31, 1803) which had been purchased through a treaty with France in April of the same year. The date of that Congressional resolution is now more recognized by us as Halloween, but was better known before the 18th Century as "All Hallows Eve," or "All Saint's Eve," in celebration of November 1st as the date to honor all Saints. Saints attain sainthood only after death, and November 1st was a fitting date to sanctify as "All Saints" as it was the festival of Samhain when the Earth was thought to enter a zone of death -- currently known as winter. October marks the beginning of fall for most us in the Northern Hemisphere, kids are back in school, the last big B.B.Q. except for football celebrations is past, and the buying of necessities for back to school is over. The next big retail event is Halloween. It’s hard to miss, warm brown and orange color tones, straw scarecrows, large Styrofoam tombstones, and many large bags of candy￼ sold just in time to consume two or three before we even start to think about the cheap stuff to give away to the trick or treaters on the 31st. What all this means is that it’s time to get ready for Halloween. It’s time to bring out the various Harvest Festival decorations to adorn the mantle and make our houses and offices more festive. The Harvest Fest, the predecessor to All Hallows Eve has been a celebration from seemingly “time immemorial” as generation after generation has reaped the bounty of the seasons’ crop before the harvest moon. But the fun in October, especially toward its 31st day, is that revelers can take on the role of their favorite alter ego, and let that bit of their subconscious play itself out in their wardrobe selection. It really begins as you mix with the company of other celebrants in a costume ball. 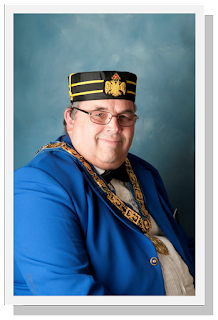 There are numerous costumes that would suit any brother who wanted to inject Freemasonry into their costuming decision and bring the Fraternity to a party. A great costume for any Mason might be one of the unmistakable Brother George Washington. With or without the apron, the characteristic blue and tan jacket, the high socks, shoes, hat, gloves and wig will create a complete and unmistakable look which could also be used on several other occasions including 4th of July or in Constitutional Observances. You could even round out the look with an authentic reproduction of his apron which would go nicely right over the costume. Other distinctive early American Masonic choices might include Benjamin Franklin, Paul Revere, or even John Hancock. Whatever your choice of costume might be, enjoy the month of October, the various fall Festivals and the beginning of the upcoming Holiday Season. This article is based in part on information found in the September 2010 Masonic Traveler Magazine and in an article titled Mundane Astrology, Copyright © 2002 Edward Kohout.